Japanese carp is called "Koi". Koi fish is considered a fortunate creature in Japan. 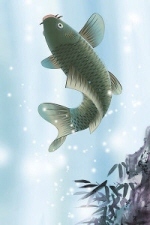 There is a legend that carp become dragons when they jump over waterfalls. So, jumping carp symbolize strength and success in life.